Homespun Stitchworks..... For the love of vintage: Banner making! At the moment I am working on a banner for the publication Pretty Nostalgic. I have been given a little instruction as to the needs and my own artistic licence to carry out this great project! I am very honoured and excited about it. I am having to work basically on my dinning room table because of its size, luckily the weather has been so wonderful we can eat outside and I do not have to move anything as it is laid out precisely. I have to get it finished by the first week in September and it will be at the Goodwood Revival! When it is completed I will put up a picture for you. 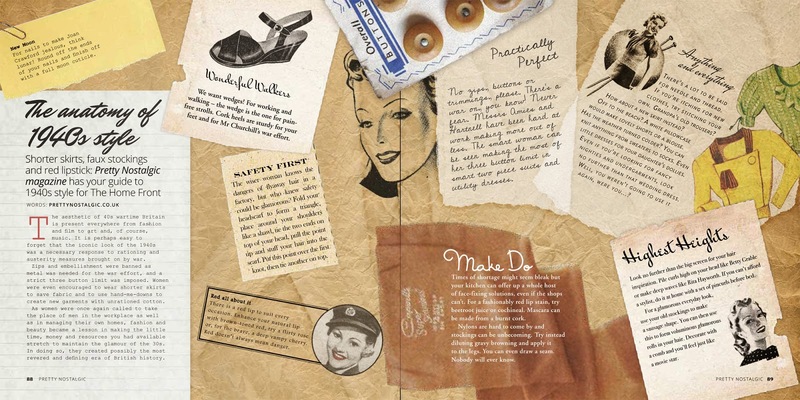 In the meantime why not have a look at Pretty Nostalgic website and take a look at there amazing magazine ( I am a business subscriber myself) and see how beautiful this publication is. You can become a subscriber yourself, just as a regular reader. Have a look and support this great vintage read who says they are ' proud to be brilliantly British' and lead a creative and sustainable living inspired by the past.